Neoprene Fuglies stubby cooler. Screen printed logo on both sides. Stitched seams and folds flat. Black suede cap with embroidered logo and 4 LED cap light built into the brim. Our semi-rigid belt case is made from rugged black cordura and features a nylon zip, webbing belt loops, swivelling snap clip, and a soft inner lining. 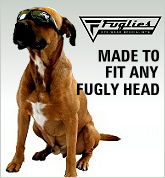 You get one free when you buy a pair of SAS Ballistics or Fuglies Ballistics. Rigid carry case with nylon fabric outer, soft flocked inner lining, heavy duty nylon zip, and swivelling snap clip. You get one free when you buy a pair of ADF Ballistics (ADF8) or Gloss Black Polarised Ballistics Mongrels (PP11).